Two IWPS House Team members took part in a donkey rescue operation today, 29 May 2013. 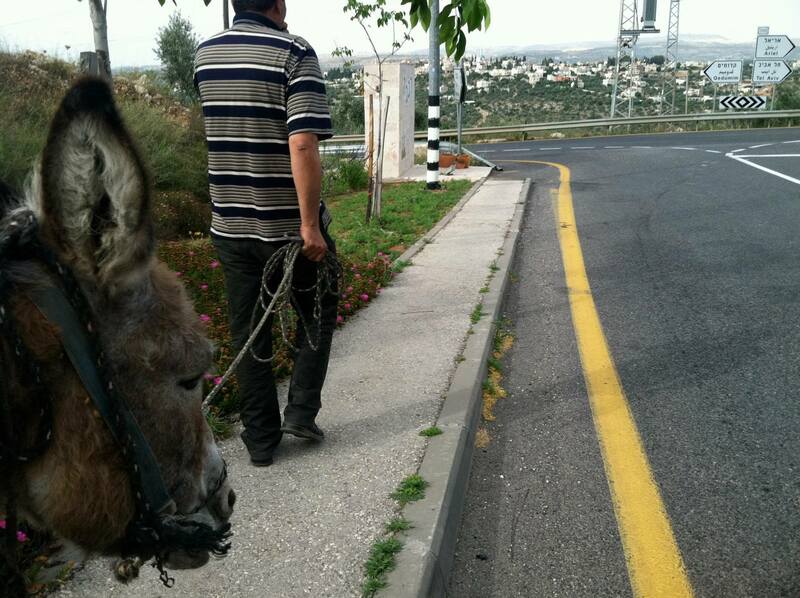 It all started when our good friend in Deir Istiya, let’s call him Z, invited us to accompany him to the nearby illegal settler colony of Revava (on the Deir Istiya-Hares road), where the donkey belonging to a local Palestinian farmer had been taken several days ago. The farmer suspects that the donkey somehow managed to release itself from the rope and the stone it had been tied to in the field, and wondered off; he then saw a man from Revava take it inside the settlement. The four of us arrived at the gate to Revava at around 16:00 and explained the situation to the security guard, who called his boss. After 15 min a man in a jeep arrived and, having lectured us about the “danger” that the donkey had allegedly caused to the illegal settlers (“It wanted to attack two cars and four people, one of them a mother with a baby!”), assured us we would get the donkey back soon. We waited a bit more, until he drove by us again to tell us the donkey would be back in 2 min; 20 min later another illegal settler brought the donkey to its rightful owner. The man in the jeep again told us that the donkey is “very dangerous” and that Z should tell every single farmer in Deir Istiya “to keep their donkeys inside”. We then headed back, the four of us and the wandering donkey, which looked very calm and harmless. The illegal settler colony of Revava is built on land stolen from the Palestinian villages of Deir Istiya (some 1,500 dunums stolen) and Hares (around 1,000 dunums); some of it was also bought. In 1997, villagers from Deir Istiya won a legal case in the highest court against land theft, but the court decision to give parts of the land back has never been implemented. Instead, in 2008 a new case was brought to Israeli courts; a District Liaison Office (DLO) issued a permit for the villagers to do a land survey to determine the exact amounts of land stolen; however, the two people who arrived to start the survey were not allowed into the illegal settler colony, even despite the presence of the Israeli army provided by the DLO who ordered the settlers to allow the surveyors in. One case is still in the courts. The wandering donkey was returned to us, as our contact had predicted, without trouble. The on-going conversation of the “land swaps” has put political pressure on the settlers to calm their violence, while the possibility of the illegal settlements’ annexation to Israel is still on the table.